Now, to step down from my soapbox. Refocusing on my sweet baby, that at 38 weeks was measuring well over 8 pounds on the ultrasound. On Monday, January 5th, I visited my doctor's office because I was so sick and afraid I had Istrep. After enduring the 3rd strep test of my pregnancy, I was told I did not have strep and that I should just go home, take Tylenol, and sleep. The strep test is one of the most horrible diagnostics out there, and for a pregnat woman, it is sheer torture. Shoving a foot long swab down the throat of a woman with a very heightened gag reflex is not only disgusting for the woman, but very dangerous for the person on the other side of that swab. Yuck! I remember going to work that day sick, miserable, and surprisingly cold though I was carrying a giant heater in my belly. I left work early that day, and the following day as well, spending the time I was at work cleaning out my officeand packing up the past 3 years of my life. Not normal procedure just for maternity leave, but with the dark cloud hanging over the Goody's building, it was the smartestthing I could do. On Wednesday morning of that week, I had a routine doctor visit scheduled. During the 2 hours that Chris and I were there, everything we had planned for the last 8 1/2 months became reality. Following an ultrasound, we met with the doctor, and he matter of factly said to us, "Guys, you need to have this baby tomorrow." Completely stunned by this, I am pretty sure my jaw dropped to the floor while Chris' heart simultaneously skipped a beat. The only thing I could think to say was, " I am so sick and can't breathe. Won't that be a problem when I am trying to deliver a baby?" The lovely doctor said to me, "Yeah, but you'll live." With that, he was out the door, and Chris and I just sat in silence for what seemed to be 2 hours. It was really only about 2 seconds, and when we realized this baby was coming 2 weeks early we were thrilled and terrified. Our plan was for me to go home and rest all day, Chris was going to work, and that night, we would get everything together and head to the hospital the following morning. My sweet husband brought fried rice, spring rolls with very hot mustard, and extremely spicy miso soup home for dinner. Yum! And quite good for clearing out the sinuses. Following my dinner of fire and rice, we settled in to rest a little and head to bed. Between the coughing, stuffy nose, and the anxiety over what would happen in the morning, sleep was not on my agenda for the night. The following morning, we were at the hospital at 7:00am. 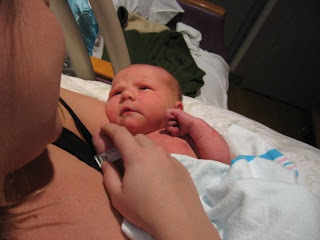 As soon as we got there, I received my IV, had bloodwork, and was hooked up to the heart monitor and the fetal monitor. I will spare you the details of the following 14 hours, except to say that I was the envy of every nurse in the place. My husband was a hero that day. He was so loving and patient. He stayed right by my side for every single second of the day. The only time he left me was when I forced him to go eat lunch with my dad. I can not even begin to describe the how amazing he was. I have always known that I married a man that loved me every minute of every day, unconditionally, but our love rose to a new level that day. I fell in love with him that day, again and again. In a matter of hourse, I watched this sweet boy become a strong man. It was the only thing that kept me going that day. After 14 hours of coughing, crying, and contracting, we were faced with a huge decision. Keep trying, keep waiting, or go in for a C-section. Layla's safety was at risk, as well as mine. Therefore, we decided that a C-section was the best choice for all of us. This decision was made at 9:00 pm, and Layla arrived at 9:53 pm. The time in between is a complete blur. I know Chris was a rock through every second of it, and I know that the second I heard her cry that my life changed forever. I could hear the echo of her screams in that cold, bright room, and when I saw her, I felt something that can only be described as a combination of what I felt the day Chris proposed, the day I married, him, and the day that pregnancy test showed 2 lines. The events of the previous 27 years finally all made sense. I knew why I had been put on this earth. I understood that my life had purpose. I knew something huge was happening in the tiny operating room in that tiny hospital. In that brief second, that is when my name changed from Ashley Breanne Blankenship to Layla's Mom... the greatest name I could ever have!